It seems a while since my last blog, we have been very busy. We are also enjoying training in the lighter evenings as spring is fast approaching. Just before Christmas we attended our first ever able bodied competition at a local unaffiliated competition but the classes were judged by a British Dressage listed judge. In the lead up to the competition I was a little worried with how I would cope doing a dressage test with canter in as I had only learnt to canter in October and I had never cantered Tidy away from home so I was a little apprehensive on how she would react in a strange place as she can be a little more forward away from home. I had no need to worry, Tidy was perfectly behaved throughout the day and I was very grateful to my friend Becky for taking Tidy for me. It was Christmas themed which was lovely so Tidy wore her reindeer fly veil and some tinsel around her neck. The venue and people of Oswestry Riding Club were very friendly and welcoming. I warmed up outside and Tidy was listening well to my aids and quite relaxed. For my first dressage test I entered the Intro C (walk and trot) which is similar to my para dressage test so Tidy had chance to look at the indoor competition arena as there was a car for the judge to sit in which is something Tidy hasn’t seen yet with her limited competition experience – as expected she had a little look at the car but soon settled to do a lovely relaxed test to be placed 1st with 74.56% which I was more than happy with. 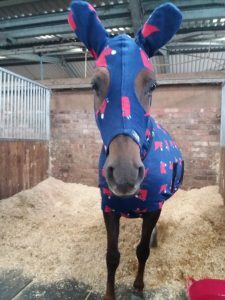 Our next test would be my first ever dressage test with canter in so my plan was to survive and come out together – I knew Tidy would be fine but it was more whether I would be able to get the canter in all the right places and keep my balance. Tidy looked after me and did a very pleasing test, listening the whole way through to be awarded 71.13% and 2nd place – I was so pleased with her, we lost the canter in one part of the test as Tidy was looking after me but we managed to recover the canter. I was so proud of her, she is a pleasure to take out and about, trying her hardest at all times even when she is unsure in a new environment. After the competition our training was put on hold due to snow and ice, then before I knew it was Christmas so Tidy had her planned two week holiday. I think it important for her to have a holiday for some down time and time to be a horse. January was spent focusing on training at home, having our regular lessons with our coach, Helen and also doing so pole work to keep Tidy’s schooling varied. I can’t believe Tidy will have been with me two years this year, she has come so far and helped me get my confidence back as well as achieving my ambition of learning to canter and compete able bodied. Tidy came back from her holiday feeling rather well with a spring in her step so we have been focusing on maintaining a relaxed rhythm as she could sometimes get a little forward using half halts and also keeping her mind occupied in the school varying the exercises. She is always eager to please so sometime tries too hard.